Did Russian Roulette Nearly Claim ExoMars? The Russian roulette that is that nation’s launch industry nearly claimed Europe’s most ambitious planetary mission earlier this month. That’s according to a report from Anatoly Zak in Popular Mechanics. Zak says there is evidence of an anomaly that sent pieces of the Proton launcher’s Briz-M upper stage into interplanetary space along with ESA’s ExoMars spacecraft. According to sources in the Russian space industry, the first of Briz-M’s two collision-avoidance maneuvers was to last around 12 seconds. Once it was a safe distance from ExoMars, the rocket stage would fire again, this time for around 1.5 minutes, until the engine consumed all the remaining explosive propellant aboard. Upon completion of the second maneuver, valves would open to vent the high-pressure gas used to force propellant into the engines. That’s what’s supposed to happen. The initial info available to Russian tracking experts after the launch of ExoMars indicated that Briz-M had worked as planned. But the latest tracking photos indicate that something happened before the spacecraft had had a chance to go into its graveyard orbit. “The ESA–Roscosmos ExoMars Trace Gas Orbiter (TGO) and the Schiaparelli entry, descent and landing demonstrator are well on their way following the 14 March launch from Baikonur Cosmodrome in Kazakhstan,” the agency said. Russia has suffered through a long string of launch failures dating back near seven years. Many of the failures are traced to the Proton rocket and the Briz-M upper stage, which are both produced by the Khrunichev State Research and Production Space Center, which has experienced serious quality control problems. 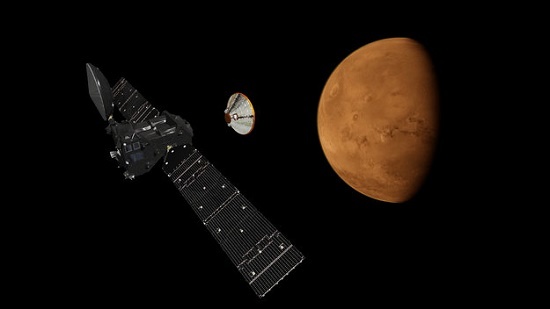 Hopefully the debris causes no further threat to ExoMars!